Fine art albums are completely custom, hand made with the finest materials, and guaranteed to last a lifetime. A choice of leather covers, a photo on the cover, and name and date imprinting are included. Coffee Table Book with a silk fabric cover in Taupe. To see photos and a detailed description of the coffee table album, please click here. Fine art coffee table books have thick and sturdy pages, and the photos actually are the page itself (no mats). The book includes 50 images and approximately 25 pages. Additional images, over 50, are $22 each, or $17 per each when added in groups of 10. Matted Book in white leather. To see photos and a detailed description of the matted album, please click here. Fine art matted books are a more streamlined and updated take on the traditional matted album. The book includes 50 images and approximately 25 pages. Additional images, over 50, are $24 each, or $19 per each when added in groups of 10. *To tell the complete story of the wedding day, albums typically contain 75-100 images. There is a maximum of 100 images per album, for large weddings we recommend a two-volume set. For the design process, you may choose all the images to include, choose just your favorites and we fill in the rest, or have us select all the images. No matter your decision, you will see a digital proof of the album prior to going to print and be able to make any changes you would like. When ordered at the same time as the bride and groom album, parent replicas are offered at a discount. Fine art coffee table parent replica albums are 8X8 in size and are 40% off. Fine art matted style parent replica albums are 12X12 in size and are 20% off. Petite album replicas in 8X8 size are 20% off. 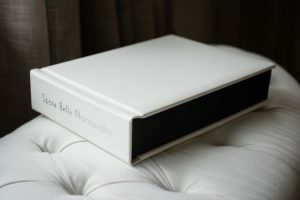 Custom coffee table petite albums are offered in black leather. Custom matted petite albums are offered in 10X10 size with black leather.